Join us for a hands-on, technique-packed workshop featuring loads of “how to” and practical discussion for utilizing the Marabu line of textile enhancing products. We will incorporate paints (Textil and TextilPlus), sprays (Fashion Spray and Fashion Spray Shimmer), and Liners (Fashion Liners) to create one-of-a-kind decorative fabrics from plain white and black cotton. 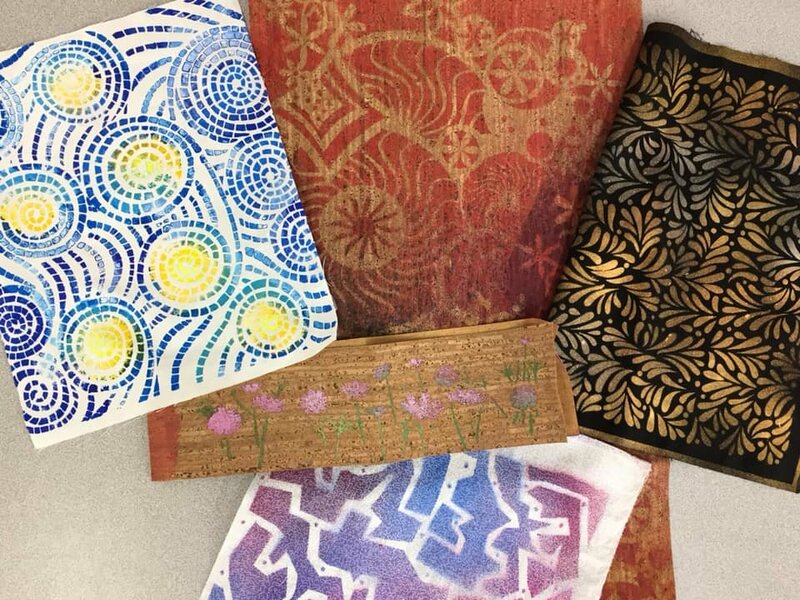 We will also explore a versatile new material: cork fabric, and experiment with ways to make this fun, fashionable, and functional material work in many different applications. All supplies needed to play along (fabrics, cork material, and denim squares, use of paints, sprays, liners; stencils, paint brushes, stamps and other tools) are included in the class kit. Requirements: Workshop is good for anyone who wants to have fun!!! Instructor Bio: Penny Arrowood is a mixed media artist who specializes in creating with paper. Books and book structures, collage, and assemblage are her primary areas of creation. Sometimes, however, she is unable to resist the siren call of beautiful fabrics and trims! These often find their way into other projects in the form of book cloth and dimensional embellishments. She has never met a button she didn't like, and is thrilled to be offering a hands-on workshop to the denizens of BERNINA World of Sewing in Raleigh.